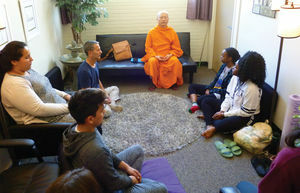 United States: For social responsibilities, at Dhammakaya temple under the vision of Ven. Dhammajayo, we host meditation classes to serve the community. According to the National Center for Complementary Health and Integrative Health, meditation can help improve psychological distress, anxiety, depression and increase relaxation and overall health. Contact your nearby branches for more information. This entry was posted in Editor's Picks, News and tagged Azusa, Cal Poly Pomona, California, Dhammakaya, meditation.